Not quite half its peak during the original launch in 2012, but almost. It was a big weekend for No Man's Sky. Following the release of the Next expansion, Hello Games' space sandbox drew a peak concurrent playercount of around 97,000 players on Sunday. That's not quite half the total the 2016 launch drew on Steam, which was just over 212,000 concurrent users, but it's close, and not bad for a game that's been out for two years. As a reference point, a Reddit member pointed out that this weekend's surge of players surpassed The Witcher 3's all-time peak of around 92,000. Beyond the co-op multiplayer and other new features of Next, the price drop to 50% off is certainly helping, too: NMS has been sitting atop Steam's global top sellers list since Next launched last week. Reviews on Steam have also risen from 'Mostly Negative' to 'Mixed', which makes me think of the episode of Arrested Development when the Bluth's stock rose from 'Sell' to 'Don't Buy', but an improvement is an improvement. We've been among the players exploring the features of the new expansion. 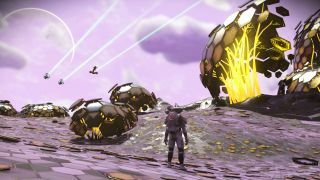 Andy cataloged the coolest things he's seen in Next so far, I found a bizarrely sad little planet where happiness is forbidden and one where the awful weather made me never want to leave. In other words, if you own the game but haven't played in a while, it's a good time to try it again.